Recently, The Australian quoted former Hockeyroos coach, Ric Charlesworth as saying other codes could be concerned because the AFL could steal elite athletes away from them, as it has done in the mens scene. In October 2016, it was reported that the FFA had agreed to pay allowances to W-league players. Amateur players will now receive an allowance in line with male National Youth League (NYL) and state competitions – between $60 and $150 a week. In November 2016, the final pay details and arrangements for the womens AFL comp were announced. carers allowance for players travelling interstate who have a child under 12 months old. The two-year agreement will see the packages increase in the second season in all categories with the minimum payment being $9,726, while priority players will receive $12,486 and marquee players $27,946. The increase is up from the initially proposed base of $5,000 specifically to help cover health insurance. “The main thing from the commission’s point of view was if we can make a larger contribution to private health insurance, we did. $500,000 was put towards that specifically to cover every girl’s private health insurance,” Lethlean said. The AFL’s direct financial commitment to player salaries totals $2.275 million for the 2017 eight-week season before increasing to $2.454 million in 2018. 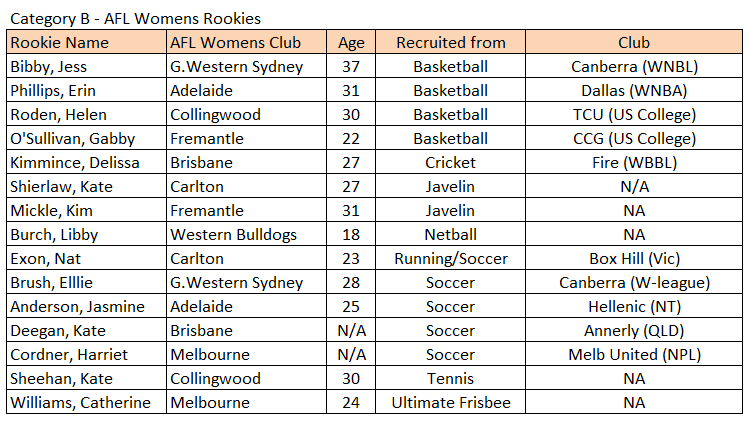 NAB AFL Women’s players will be engaged with their club for nine hours per week during the pre-season training block (8 weeks) and nine hours plus match-days during the eight-week season, to help minimize distraction to their current employment and study commitments. They will also complete 20 hours of appearances under this agreement.